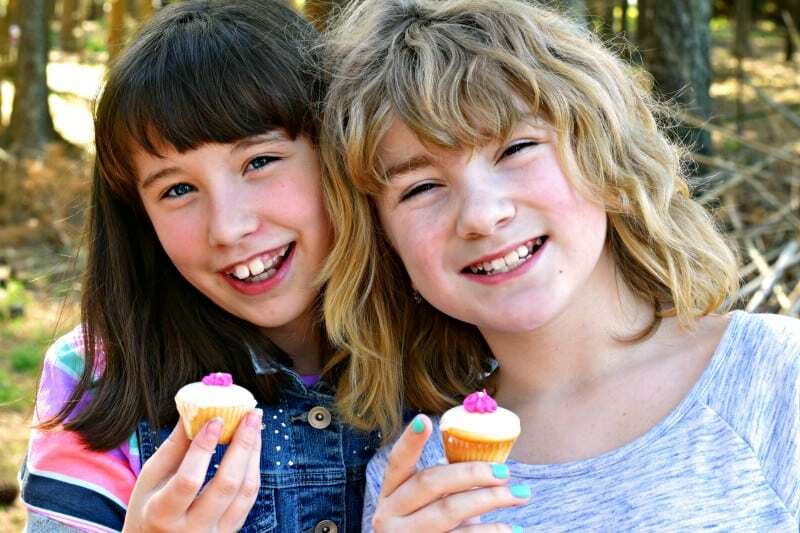 Katy’s Petite Cakes are our version of Petit Fours only without all the fuss. My Katy has been batting a thousand with recipe ideas here lately, and I just love her interest in cooking so we’re trying out every one we can as soon as we can. We’ve had two great successes this week. For starters, we created a recipe for dog cookies – and the dogs wholeheartedly approved so I have nothing left to show for them but we plan on photographing the recipe soon for SouthernPlate. The second recipe would be these precious little “Petite Cakes”, our version of Petit Fours only without all the fuss. 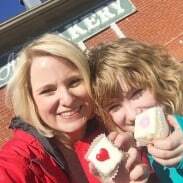 You see, Katy and I are devoted to these amazing little petit fours that they make at Peggy Ann Bakery in Huntsville, Alabama. We don’t get there but a few times a year but when we do, the occasion is met with photos of our petit fours and little white bakery boxes to bring back home and share with those we love the absolute most. One of these days, when I move a ways off to let my hair grow out and spend the rest of my days living as a hermit in the woods somewhere, I’ll make that one trek to “the big city” each year mainly for Peggy Ann Petit Fours. How many times have I said “Life is really simple, but we insist on making it complicated.”? That child, that child. I told her to always remember what she just said because it will become even more true as she gets older. And then we made Petite Cakes. In keeping with Katy’s wisdom, we kept this recipe simple. For the cakes themselves, we just used a box of white cake mix. We did substitute milk for the water the recipe called for but that is just my personal preference. Bake them in mini cupcake papers according to package directions. I believe these took about fifteen minutes or so to be done. Here is a little #protip: Place all of your cake batter into a zipper seal bag and seal well. Snip off a small portion of one corner and squeeze the batter into your muffin papers for mess free ease that saves a lot of time. The trick is the petit four icing. Now there are all sorts of petit four icing recipes on the internet that call for a laundry list of ingredients but all you really need is a thick confectioner’s sugar glaze. Confectioner’s Sugar, Milk, Flavoring. Three ingredients. I use butter flavoring in mine but you can use a bit of vanilla if you like, clear would be best so your icing stays white. It is very important to add a flavoring, though, because confectioner’s sugar on it’s own is NOT a good taste. Stir these together until there are no lumps. It may take a minute or two but it will happen. Now you want your icing to be the consistency of school glue. I’m giving you basic measurements at the bottom of this post but you may need to tweak it a little bit by adding a bit more milk if it is too thick or a bit more sugar if it is too thin and stirring well again. Don’t panic, honestly, this is no big deal and you’ve got this. We all have those times in our lives where we feel we can’t possibly get something right on our own but here, and in other situations, you’ll see that the folks who filled your head with that kind of nonsense were just idiots. T’ain’t nothing you can’t do if you set your mind to do it. Truth be told, you already knew that but you just need someone to remind you of it from time to time. 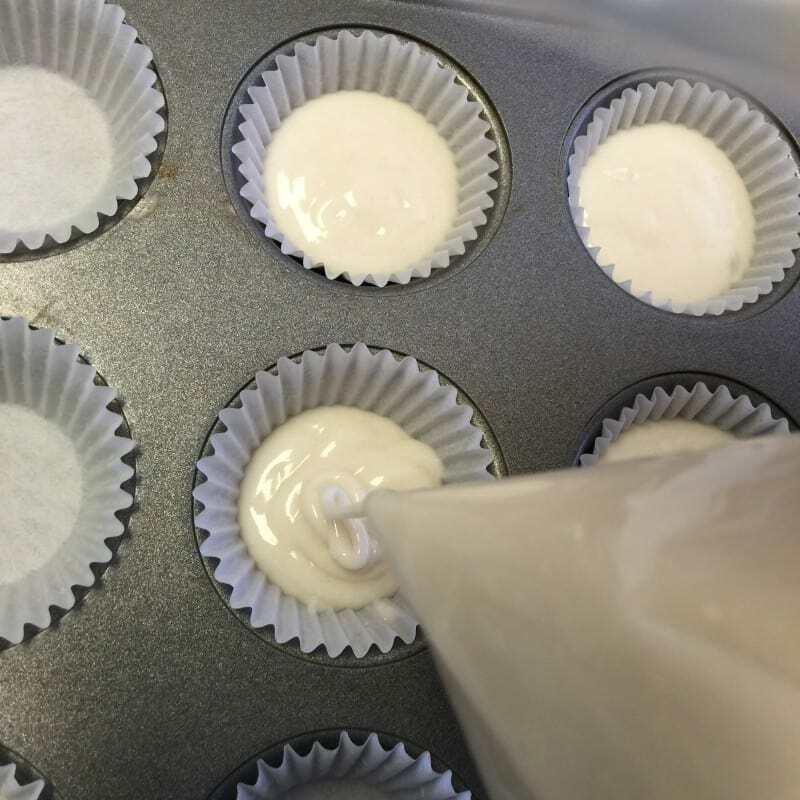 With a good grasp on each cupcake, dip the tops into the icing, let it drip for just a moment when you pull it out, and set aside to dry. Repeat with all of the cupcakes. Katy did all of these herself. Let them dry a few minutes and then top with roses, if you like. In keeping with the simple nature of this recipe, we just used store bought icing for the roses. I got vanilla and dyed it a deep pink. To make these little flowers I just used a 30 tip. All you have to do is place a tip in the icing bag and fill the bag with icing. 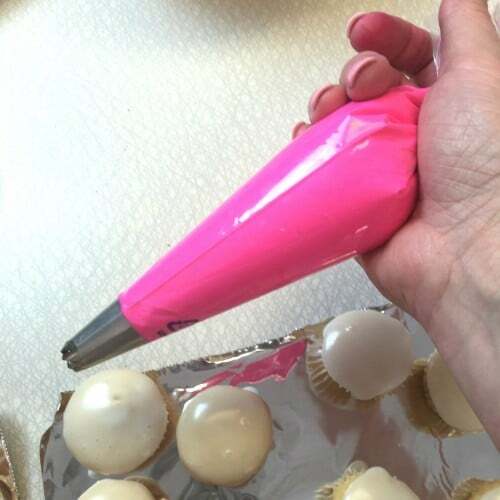 How I hold my icing bag: The end is twisted to hold the icing in and that is pinched between my index and thumb finger, then the fatter part of the bag is held and squeezed as I work with the palm of my hand. Make a flower: With the bag straight up and down, not tilted, gently squeeze out a little icing, stop squeezing, wait one second, and pull your icing bag up. As long as you stop squeezing before pulling your bag up you’ll have a nice little flower. I went back with some kitchen tweezers and added in a little pearlish looking sprinkle to the center of each one, which took me all of three minutes. Another easy way to decorate them is to just put some colored icing in a gallon zipper seal bag and cut just the tip off of one corner, then do a few zig zag lines across the top of each one. Let these sit out for an hour or so until the icing crusts over a bit and then store in an airtight container – or eat them all. Totally up to you but I wanted to offer up both options ;). If you have a friend or two around, they can help you with the eating option, too! Prepare cake mix according to package directions and divide it evenly among 48 mini muffin cups in a muffin tin lined with mini cupcake papers. Bake according to package directions, which will be at 350 for about 15 minutes or so (give or take), or until cupcakes bounce back when lightly pressed in the center. Remove from oven and allow to cool completely. 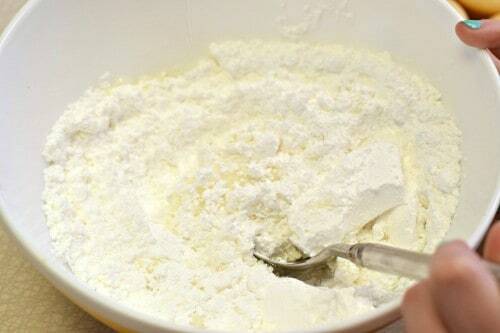 In medium bowl, stir together confectioner's sugar, milk, and flavoring until well combined and no lumps. Mixture needs to be the consistency of school glue. If it is too thin, stir in more confectioner's sugar (a tablespoon or so at a time). If it is too thick, stir in more milk (a teaspoon at a time), until desired consistency is reached. 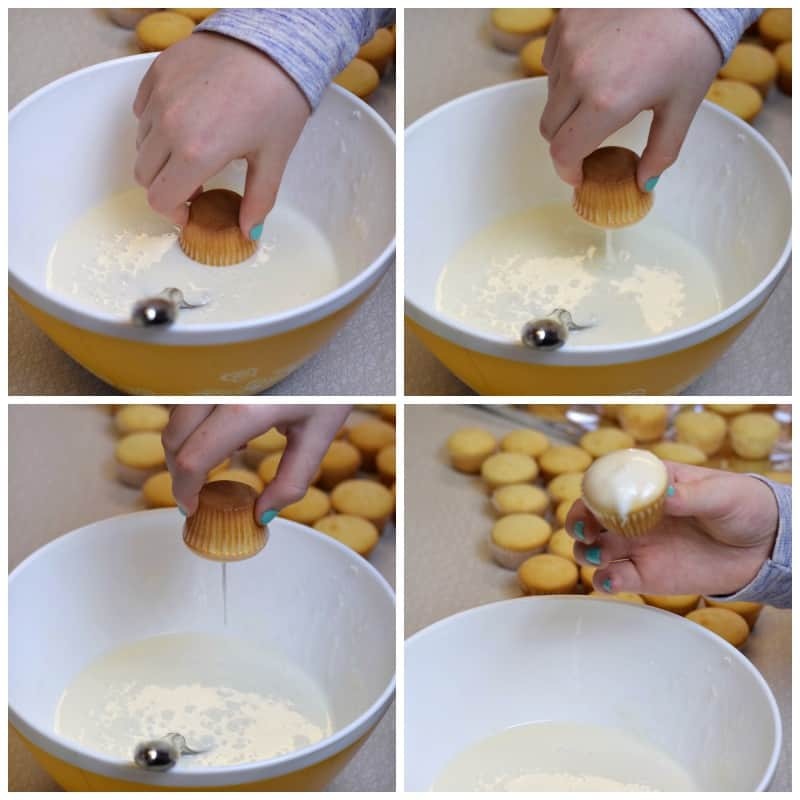 With a good hold on each cupcake, dip the tops of them, one at a time, into glaze. Hold it upside down over the bowl for a second or two once you remove them to allow excess glaze to drip off. Flip right side up and place on a platter or waxed paper lined countertop to dry. Repeat with remaining cupcakes. 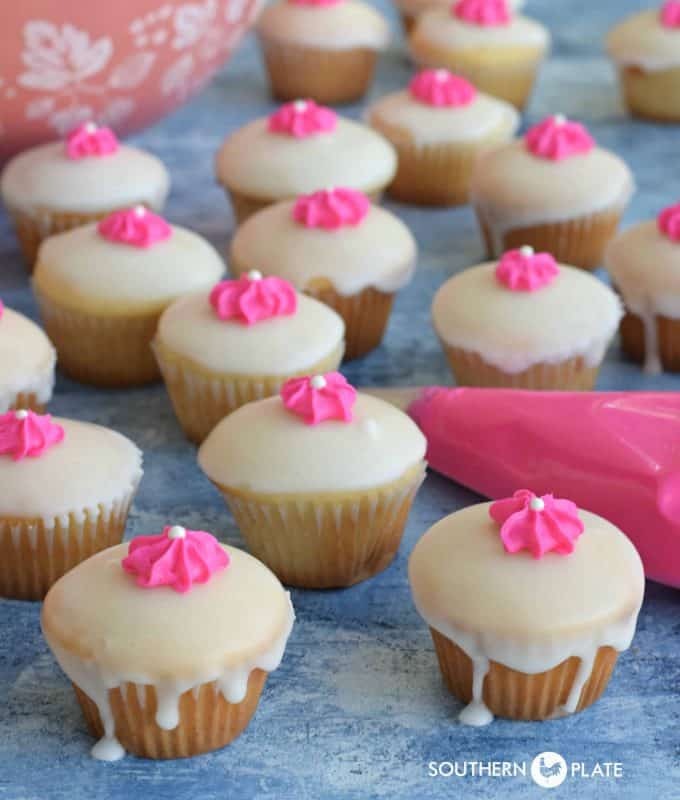 Once cupcakes have dried some, place a #30 tip in an icing bag and fill with icing. Twist down the top to close and hold bag as pictured in this post. With the bag straight up and down, not tilted, gently squeeze out a little icing, stop squeezing, wait one second, and pull your icing bag up. As long as you stop squeezing before pulling your bag up you'll have a nice little flower. Optional: Use kitchen tweezers to add a little pearlish looking sprinkle to the center of each one. Allow to dry for a bit so icing develops a thin crusting on outside. Serve immediately or store in airtight container at room temperature. Note: Another simple way to decorate these is to place colored icing in a zipper seal bag, seal well, snip off a small bit of the corner, and zig zag it over the top of each one. LOVE!!! Wish I had some! Good going Katy! For some reason, my icing always melts, and ruins my petit fors. Is it too thin? Or because I only glaze them once (I pour instead of dip)?? The weather maybe?? I would try making it a little thicker. I completely understand as I always make mine too thin at the start :). It should be the consistency of school glue. Petite cakes? They are cupcakes, right? Katy is wise beyond her years! I am so Happy to see her enjoying cooking, baking and spending time with her mama. I cherish the memories of the times my children and grandchildren spent in the kitchen with me. It makes my heart soar. I know there will come a day when she won’t have as much time to spend with me but I hope she cherishes the memories we are making as much as I will!! Can’t wait to see the dog cookies. They will be coming up soon Jean. I hope you have a blessed day as well!! A big thank-you to you and Katy! I love Petit Fours and like you a couple of times a year I make a trip to my local bakery and buy 2 and 1/2 dozen. I have them boxed by the half dozen. Since they are just such a happy little treat, I take a box each to two of my co-workers and a box to my mom…. leaving 2 boxes for me! I freeze one box at home, eat one Petit Four and freeze the other 5 from the 2nd box at work (yes, this takes all the willpower I can muster!). When I am feeling like a little treat, I put on the kettle for a cup of tea and pull out a Petit Four and by the time the tea is steeped the cake is thawed and ready to eat. Thanks to Katy (and you) I can make a batch of these any time and have more to share with family and friends! I love how you share them and freeze them!! That is so sweet of you Leta!! I hope you get the chance to try them soon and love them as much as we do!! Ohhhh, smarty pants. The straightest line from no petit fours to many petit fours is indeed cake mix, mini muffin tins and powdered sugar glaze. As someone more eloquent than me once asked, why go around the block to get next door? I’m not a fussy baker either, but I believe I could manage these little beauties. I could even manage to dip them twice to make the glaze shields extra powerful. 😀 Good job, team! 🙂 LOL, I love that…”why go around the block to get next door”!!!! Ooooh, can’t wait to make these! I might go half-and-half on the flavoring–part almond and part vanilla. Yummmmm! Oh my goodness, I agree Jennifer, time definitely needs to slow down!!! What a GREAT idea, Katy! I love petit fours and have always wanted to try to make them…until I think about all the steps involved. I’ll definitely be trying these out soon! 🙂 We hope you enjoy them Leann!! Katy said Thank You!!! Looks good! Good job, Katy! I used to love petit fours…before I had to become gfree. Since then I’ve yet to make any. I do love almond flavoring in them though. I might just have to give them a gf try…with almond! I hope you get a chance to soon Alyce, let me know how they turn out please!! These look good Katy! I might try these with almond flavoring. I hope you get the chance to soon Joanne!! Great idea! Can’t wait to try them. I might make them for teacher appreciation next month. Thanks for always coming up with something new. 🙂 I hope everyone enjoys them!!! Katy knocked it out of the park with this one! Please tell her thank you. I’ve always loved Petit Fours but have never made them. This is an easy way and they look so cute! Thanks to you for the hints about putting the batter in the cupcake liners as well as making the rose decoration. I’ve never been told to stop, wait a moment and then lift the icing. Can’t wait to try this! I hope you enjoy them Pat!! I will tell Katy, I know she will be thrilled!! hey girl these are so cute! Yummy! makes me think of the times I spent with my mom and my auntie. Katy is very wise and pretty as well. God bless you both. Thank you Elizabeth, blessings to you as well!!! The petite cakes look lovely. In reading over the recipe, does the milk go into the cake mix in place of water, or in the icing that decorates the cupcake? Also, is the cake mix the new quantity of 15.25 or 16.25 plus ozs, or the former size cake mix that was 18.25 oz.? What brand cake mix? Also how do you adjust recipes that were using the 18.25oz and now are the 15.25 or 16.25, depending on which brand used? I have had some bad luck baking a recipe that was perfect using the former cake mixes and have not turned out good with the new sized mixes. Also taste on some of the mixes is off!! Thanking you in advance and hoping you can help solve my problem. The milk is for the glaze (step 2). I just instructed to prepare the cake mix according to package directions but I did mention in the post itself that I substitute milk for water when going by the package directions – that’s just another optional thing based on personal preference. You can use whatever brand of cake mix you prefer. I usually go back and forth between Betty Crocker or Duncan Hines, depending on where I am shopping as some stores only carry one brand. Those two brands have never let me down, though. Neither my mother, myself, or my sister in law (who are all avid bakers) have made any adjustments at all to the new sizes of the mixes and haven’t seen an issue. I’m not a fan of the size change myself but it appears they did their research and made sure they work with at least most of the recipes. 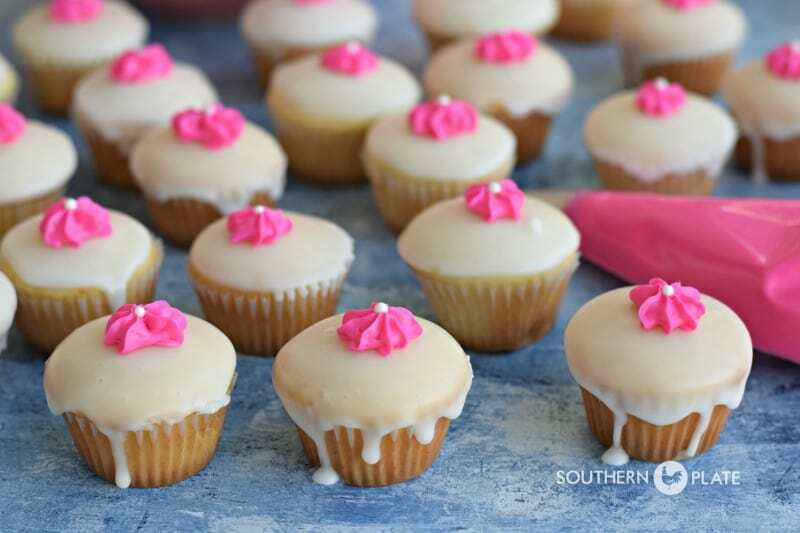 Most especially in this recipe, though, as you are just preparing it according to the directions on the package and it still makes the desired amount of cupcakes. I’m trying to think of a mix I’ve used that I haven’t had good luck with but I guess I really do tend to stick to those two brands. I use Pillsbury from time to time, too. I also have a homemade white cake recipe on this site if you need it, it is slightly less sweet (only slightly) but that allows the icing to shine a bit more without being overbearing. Hope this helps and have a great Wednesday!! I can’t wait to try these, perfect for giving a little pick-me-up gift to family, friends and co-workers. Love the photo of Katy and friend. Katy looks so much like her brother! Thank you Carole!! 🙂 Your family is going to love you even more, if that is even possible!!! I was so excited to see this post. I live in Middle Tenn now but grew up in Huntsville. We got the Petit Fours from Peggy Anns at least twice a month. Usually with my Nana (my Mom’s mom) who I practically lived with for much of my childhood, and my Mom. Then my daughter (who was 9 when we moved to Tenn) loved them as much as I did. So after we moved up here (we are about 3 hours north of Huntsville) we started the tradition of going down to get them once a month at least. I don’t get down quite as often as I used to but I get them several times a year. The girls in my office love them now, so many of those trips I buy them to bring back to work. This is such a great memory from my childhood so I was thrilled when I read your post. When I saw the headline and from a ‘local bakery’ I knew it was Peggy Ann’s before I even read it! You & I grew up very close to each other. I lived not too far from the Space & Rocket Center. I can’t wait to make these. It will be a great substitute when I can’t get down there and am craving them. On a side note, I found square cupcake pans & papers here locally so I may do that to make it look almost the same, like for a special occasion! Wow, that Katy is a smart girl! These look delicious and easy enough for me to make with my daughter. Can’t wait to try them! What a great idea! That Katy sounds like she has wisdom beyond her years. Love the picture of her. She has what I call “smiling eyes”. When she smiles her eyes smile with her that just lights up her face! Such a smart and pretty girl and I know you are proud of her. I tried making Petit Fors ONE TIME! What a MESS! I think I could do this. . . thanks to Katy and You! I used whipping cream (because I had some in the fridge) for a glaze for scones. Oh goodness! I am certain that you can make these Sylvia!!! I have faith in you!! Happy Yum Yum to all !!!!!!!! Way to go girls — you’re a good team to work with !!! Since I have an all male household ( Hubby, Son ans 3 male dogs, I am going to make these for a sweet little neighbor girl and her Mommy and have a Tea Party! Thanks ,Katy and Christy!! What a wonderful idea!!!! Please take a picture and send to me if possible!! Hey, Christy! How sweet you and Katie look with your Petit Fors! Was April 6th your birthday? That was my birthday, too. I would love to meet you and give you a hug. May I pretend that you are my granddaughter? Also, I love your recipes and your sweet inspiring words! Thank you so much Kathleen!!! I would love to meet you as well and I LOVE hugs!!! My birthday wasn’t April 6th, mine is in February, but I am all for surrogate grandparents!! I miss mine terribly and am of the opinion that you can’t have too many loved ones in your life!! Very impressed with this idea. It is so simple, but looks so eloquent. This would be great for baby or bridal showers food, or any female get together. Something about eating a pretty little cake just makes the occasion so much more fun and feminine . And the best part, is how inexpensive it is to make. 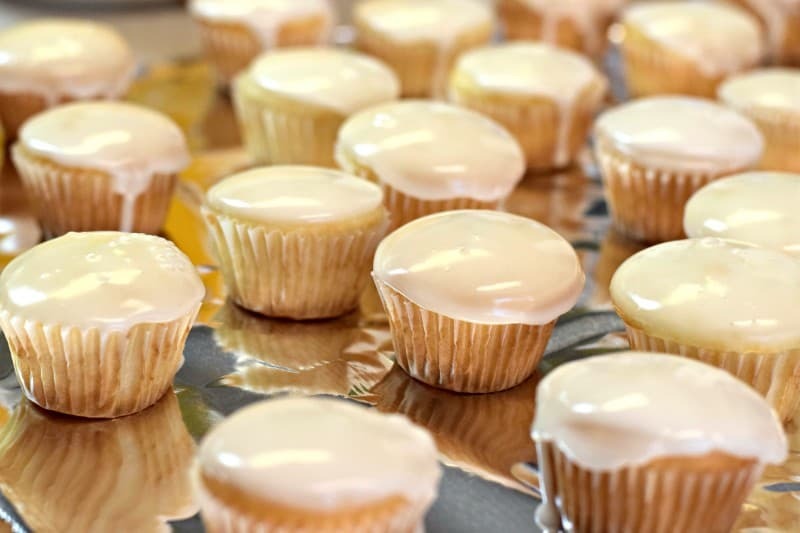 I have always used white cake mix for the base of cupcakes and iced with chocolate icing, (using the Hershey Cocoa can recipe)–it has never failed me! and then topped with pretty m & m candies, as my easy, quick decorated cupcake for most any event. I will have to try this for my next female party. Looks like the Southern Plate will have a continuing legacy with Miss Katy! I hope she will carry on our family traditions, recipes and our love of being in the kitchen!! What a precious daughter you have reared! Thanks for this. Can’t wait to make it. Katy you come up with some great ideas and this is your best one yet. I am pretty lazy though, so, I made a big giant petite cake and oohh it was so great. Thanks for the idea Katy and thanks for the recipe Christy. LOL, I like the way you think Pamela!!! 🙂 Great idea, let me know how they turn out.